No you have not read the Title Wrong, it's true we are giving away free Movie Tickets to our Beanybux.com Members. That's it, you and another person go out and have a great time and enjoy the Movies. Beanybux.com cares about its members and wants to show that Beanybux.com cares about it's Members not just online but outside of Beanybux.com. 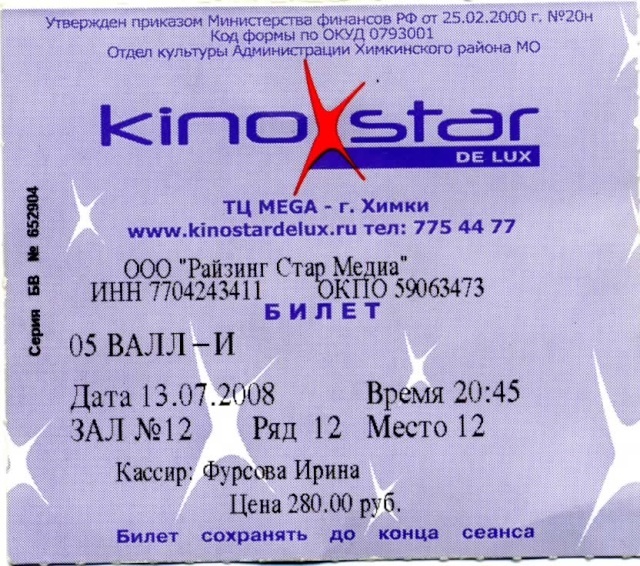 After you go to the movies, all you need to do is post the Ticket Stubs on this Thread (Up To 2 Stubs per person), and your Beanybux.com User ID. Then on Tuesday we will pick 3 lucky winners and will instantly credit the amount spent for the Movies on Saturday to their Alertpay Account. This offer is valid for any Beanybux.com Member Domestic and International. Just another way of letting Beanybux.com Members know that Beanybux.com cares and wants everyone to have fun at all times. Beanybux is getting bigger and better day by day. Yet members fail to understand it. Kudos to Admin and his staff. Keep up the good work. Haha I think its time to go to Wall-E!!! Spiky, Funny, wanna join me? XD! Of course. I am so excited for Wall-E but dont know how it works, the whole idea. FluffyWolf2 wrote: Haha I think its time to go to Wall-E!!! Spiky, Funny, wanna join me? XD! Yeah, I'd like to, but it can't be found in any theater of my city at the moment. i will try my best to watch movie with my friend and really thanks in advance for this kind of draws. i love you beanybux Nd Beanybux staff and we al beany bux members for making this place such a nice to be here and enjoy every moment of being here. Surprised no one has posted a ticket yet. But oh well And yep I convinced my mom to go, hehe ! Comments: Decent movie, with lots of action! Congratulations to the following Beanybux.com Members on entering and winning the Beanybux.com Movie Ticket Give Away. Payments will be made to the winner's Alertpay Account on Beanybux.com File. For those who missed the chance, we do plan to have more give aways in the future. Thank you for your participation and thank you for being a valuable Beanybux.com Member. Thanks Admin! I must say to all those. There were going to be 3 Randomly picked users to have their movie tickets paid for, and ONLY 3 entered! If you have time to do these events, I would encourage them! 1: You have fun, and get a break from your computer and do something fun! 2: If you don't win here, you've had fun with a friend and got to visit. 3: We do have social lives outside beany So you know its Win Win even if you don't win ! 4: Gotta try to win! Thanks Beany! Cannot Wait to get a T-Shirt so I can wear it to the Movies and such or whatever you have planned in the future! This weekend i hope go to cinema. Really date of the ticket on July, 13th. We went to cinema on Sunday =). We have not closely read through your message. But anything, we were not afflicted. I all the same very much love Beanybux! THANKS YOU, THAT YOU is!